Last weekend’s massive protest in Moscow’s Prospekt Sakharova will result in a new Soviet-style Russia not an Arab Spring-like revolution. The West had better beware because the Russian bear is coming out of hibernation. Twenty years ago this month the Soviet Union crumbled and from those ashes rose a promising Russian democratic republic. But Soviet-era corruption reared its ugly head in Russia’s December 4th parliamentary elections. That corruption sparked numerous protests, calls for new elections and earned Russia’s prime minister an accusatory message from a U.S. senator. Senator John McCain (R-AZ) tweeted Russia’s Prime Minister Vladimir Putin a satirical message. “Dear Vlad,” tweeted McCain, “the #Arabspring is coming to a neighborhood near you.” That tweet linked a news article about allegations of fraud in Russia’s parliamentary elections. Predictably Putin dismissed McCain’s ribbing as dunce naivety. Yes, Russia’s elections were likely corrupt, but they were also a gauge of the country’s mood for change which Putin intends to leverage to earn another term as president. Putin’s political party, United Russia, lost State Duma seats in the elections in spite of widespread corruption but nationalist parties which also support Putin for president gained those same seats. On balance the election confirms Putin’s political support for a back-to-the-future Russia propelled by growing nationalism. Putin intends to ride the nationalist sentiment to rebuild Russia where his former Soviet masters failed 20 years ago. Putin memorably described the Soviet Union’s demise as the “greatest geopolitical catastrophe” of the 20th century. Then two weeks ago Putin, in full campaign mode, expressed a similar sentiment on Russian television. The Soviet Union “should have started timely economic reforms and changes,” Putin said, instead the regime collapsed. Putin, a former KGB – Soviet-era secret police - lieutenant colonel, sees himself as Russia’s savior, the man destined to bring about “reforms” and “changes.” But first he must win back the presidency this March, a virtual certainty. Then Putin intends to restore Russia’s grandeur using Soviet-style politics, building a new Warsaw Pact-like geopolitical alliance, growing the military, and implementing a popular anti-West foreign policy. 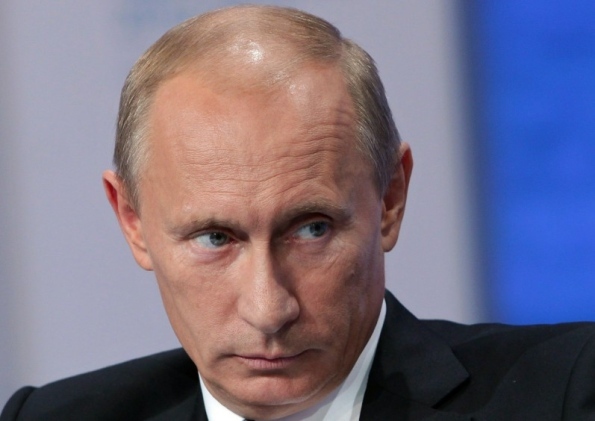 Putin’s politics are right out of a Soviet-era playbook. In September Putin and outgoing President Dmitry Medvedev confirmed their intent at the United Russia congress to extend the Putin dynasty, which started in 1999, ran through two terms as president and recently four years as prime minister. Medvedev told the congress that Putin will stand for the presidency in 2012 and he (Medvedev) is to replace him as prime minister. The party rubber stamped the Putin nomination and the prime minister accepted the unanimous endorsement “with gratitude.” Putin said between chants of “Putin, Putin” that he would build “a strong and happy Russia,” translated financial benefits for his supporters. Putin’s critics saw in that congress visions of the Soviet era. Liberal-democratic party leader Vladimir Zhirinovskiy compared the United Russia’s “Putin, Putin” congress to ones held by the Soviet Communist Party. “The same milkmaids, officers, and steel workers" with "hired hands shouting all the slogans," Zhirinovskiy said, according to RIA Novosti. Putin played to Soviet-era nostalgia when he called for building a Eurasian Union. On October 4, Putin published an article in Izvetiia announcing his Eurasia Union initiative that will have an economic focus similar to the euro zone, though led by Russia politically and bears a suspicious resemblance to that of the former Soviet Union. The objective is not to rebuild a unified state dependent financially on Moscow, but create a supranational political and economic structure that gives Moscow strategic oversight of countries on its periphery. Russia already has a customs union with Belarus and Kazakhstan, and Kyrgyzstan has indicated it intends to join. That union integrates their economies and reduces restrictions on movement of goods across their borders. A Russian-led Eurasia Union will attract former Warsaw Pact countries especially now that Europe is collapsing. It also suggests a reorientation of Russian foreign policy strategy under soon-to-be-president Putin that de-emphasizes Europe and puts Moscow in the catbird seat. Keep in mind even though the proposed Eurasia Union starts as a political and economic association it could become a defense alliance. The former Warsaw Pact was the military compliment to the Council for Mutual Economic Assistance, the regional economic organization for the former communist states of Eastern Europe. Moscow is aggressively rebuilding its atomic strike capability, doctrinally the nation’s primary means of defense. For example, just last week Russia’s Northern Fleet successfully carried out the salvo launch of two Bulava intercontinental ballistic missiles from the Yuriy Dolgorukiy, a submersed nuclear submarine in the White Sea. Such strategic modernization of its nuclear forces does not contravene the new Strategic Arms Reduction Treaty with the U.S., but it is leaving the U.S. in the dust because America stopped atomic weapon modernization projects. Moscow is also aggressively building conventional expeditionary platforms. It is constructing over 100 naval ships, over 1,000 helicopters and 600 military aircraft including the fifth generation Sukhoi PAK-FA fighter. Meanwhile, Russian ships and aircraft are returning to distant seas and air space to challenge the U.S.
Putin promises an anti-U.S. foreign policy. He told the United Russia congress he “will continue to pursue an active foreign policy” while “straightforwardly and honestly” defending Russia’s interests. He cautioned that dialogue with Russia is "possible only on an equal footing" and that "nothing can be imposed on Russia from outside." These comments are aimed at the U.S., which Putin considers Russia’s primary adversary. His concern is with NATO’s expansion into Eastern Europe and America’s European-based ballistic missile defense (BMD), which he claims threatens Russia’s sovereignty. Putin is especially weary of America’s BMD which he says is intended to neutralize Russia’s nuclear deterrent and is a pretext to station American forces in Eastern Europe. Washington argues the BMD is to counter the emerging Iranian missile threat. But President Medvedev and by association Putin threaten that if the U.S. continues to refuse cooperation with Russia regarding the BMD, Moscow will deploy its Iskander mobile ballistic missiles and early warning system on its border with Poland and Lithuania. He will target the American BMD and fit the Iskanders with advanced maneuverable re-entry vehicles and penetration aids. On other fronts Moscow is re-engaging the Middle East, such as building a military port in Syria to re-establish a Mediterranean presence. It is playing an active and unhelpful role in the ongoing nuclear crisis with Iran, leveraging its control of the Northern Distribution Network into Afghanistan, contesting arctic region claims, and moving back into areas that haven’t seen Russians for two decades. The election protests express genuine discontent with Russian corruption. But the real story is the Putin dynasty is strong and soon will shed any pretense of reform. It will tap into the growing Russian nationalism to rebuild Moscow’s stature Soviet-style with a back-to-the-future agenda which means the Russian bear is back with a vengeance.